DOTmed.com - What’s new in C-arms and tables? As more and more procedures become less invasive and shift to outpatient surgical centers and hybrid operating rooms, the C-arm market is following, with mobile systems designed with small spaces and flexibility in mind. At the same time, OEMs and also table manufacturers are continuing to keep an eye on reducing dose, while making procedures more accessible to a wide variety of patients. Here’s our guide to the latest equipment in the space. In the third quarter of 2018, Canon Medical launched the Alphenix line of C-arms and tables, with six different configurations, including three single-plane, one dual-plane, one biplane and a 4D CT system. Waldo said there is no increase in dose. “The utility of HD Imaging proves to be advantageous if we can show there is no dose penalty,” Waldo said. The company’s Alphenix 4D CT configuration fits into the fast-growing interventional oncology market for minimally-invasive tumor treatment, allowing physicians to see changes in the tumor and adjust treatment, then using the CT to evaluate the results. It is currently being used for a variety of conditions, including interventional oncology, at West Virginia University Medical Center. “This is a tool and technique that really allows physicians better overall guidance and reassurance that they have treated effectively,” Waldo said. Last October, Durabuilt increased the weight capacity of its Platinum table to 650 pounds and added a wireless hand control labeled with images instead of words. 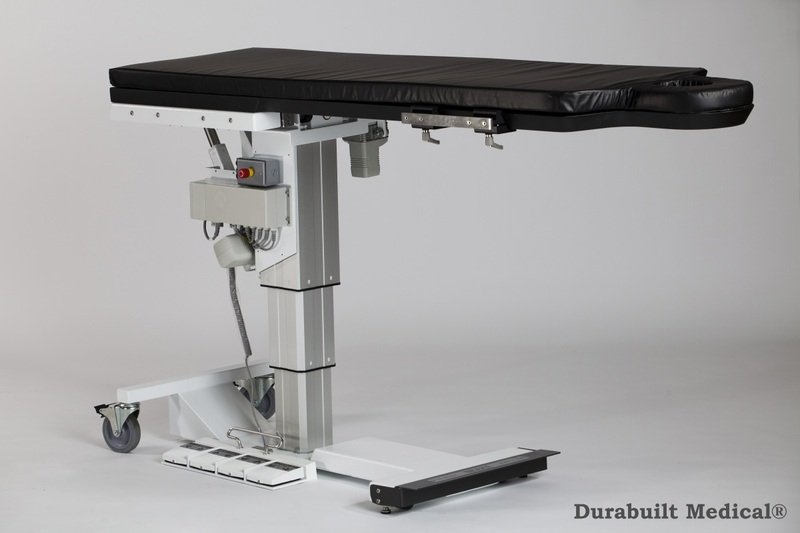 “Clinicians can visualize the table quickly,” said Tony Asbille, chief executive officer of Durabuilt Medical Tables.